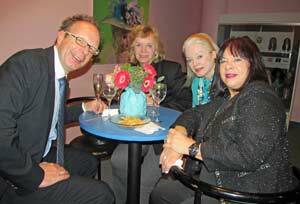 From left to right: Theriault’s President Stuart Holbrook chats with Gail Cook, Lynne Sheldon, and Alexander Doll Company President Gale Jarvis in the Heritage Gallery Entry Room. Cook and Sheldon traveled from Texas for the auction weekend. The Alexander Doll Company and well-known auction house Theriault’s hosted a gala reception at the Alexander company headquarters in New York Nov. 19 before Theriault’s auction of author and socialite Candy Spelling’s rare, vintage Madame Alexander doll collection at the Waldorf-Astoria Hotel in New York Nov. 20. 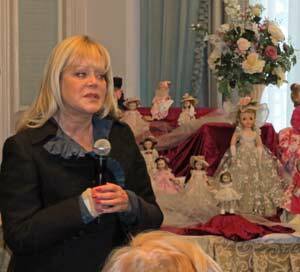 Candy Spelling speaks about her collection at the auction Nov. 20. The auction was the second of two held the weekend of Nov. 19 and 20 at the hotel. 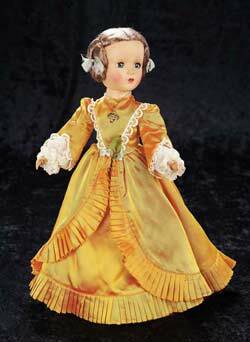 The first day’s auction, Many Wonderful Things, featured 19th-century antique French dolls, dolls by Kathe Kruse and Lenci, and much more. One of the highlighted features of the auction was Candy Spelling’s collection of automata. 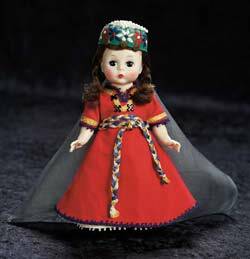 The To the Manor Born auction Nov. 20 was devoted exclusively to Spelling’s renowned collection of 350 vintage Madame Alexander dolls. 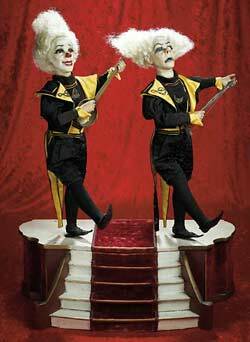 “Clown Musicians on Stage,” a 30-inch French musical automaton by Gustav Vichy, circa 1910, sold for $75,000. An extremely rare French musical automaton of a kneeling Egyptian harpist by Gustav Vichy, circa 1890, sold for $32,000. When wound, the 24-inch papier-mâché doll plucks the harp, her head turns and nods, and her eyes open and close. The automaton plays two tunes. 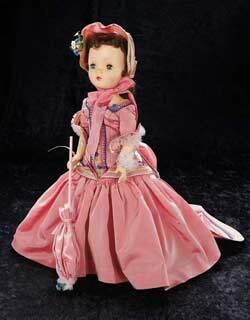 A 16-inch French bisque Bebe by Andre Thuillier, circa 1880, with shoes signed “A.T.” sold for $30,000. 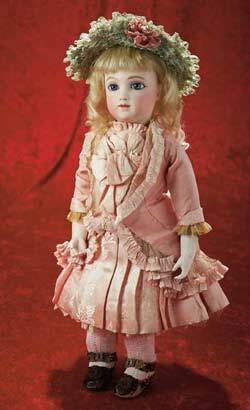 A 26-inch French bisque Bebe by Schmitt et Fils, circa 1882, sold for $28,000. Two French bisque Bebes sold for $26,000 each: A blue-eyed 26-inch Bebe by Leon Casimir Bru, circa 1880; and a 22-inch Bebe with pale blue eyes by Schmitt et Fils, circa 1878. An 18-inch “Gorgeous Agatha Portrait” from the Me and My Shadow series of 1954 sold for $18,000. A 14-inch Godey Lady in a golden taffeta dress from the 1952 Godey Lady series sold for $12,000. 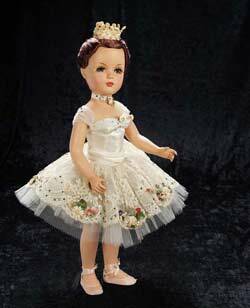 A rare 21-inch “Deborah Ballerina” portrait doll from 1951 and a rare 8-inch “Rachel” from Alexander Doll’s 1954 Biblical series each sold for $11,000. 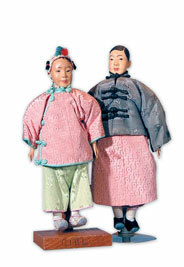 PreviousSeasoned Greetings: Toys and dolls and bears can brighten a lonely senior citizen’s day. 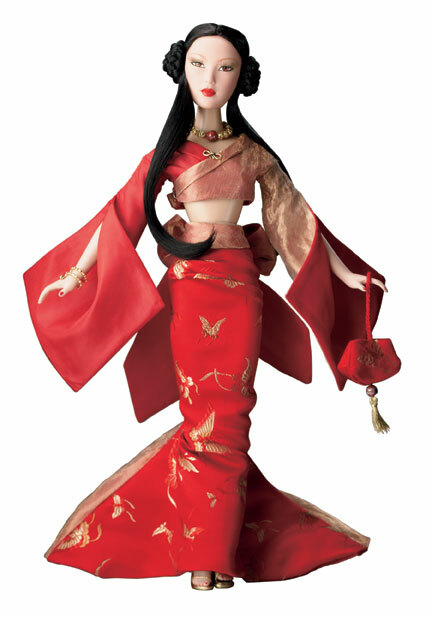 NextTeen Teams: Should tomboys and varsity letters have a place in the fashion-doll universe?